As I've gotten older, I've started paying more attention to my skincare routine. The way I did things in my 20's doesn't work as well, now that I'm in my 30's. I've started using different toners, creams, serums and masks to try and reduce and/or prevent any signs of aging. Recently, I had the chance to try out Aveeno Positively Radiant Daily Moisturizer Broad Spectrum SPF 30. 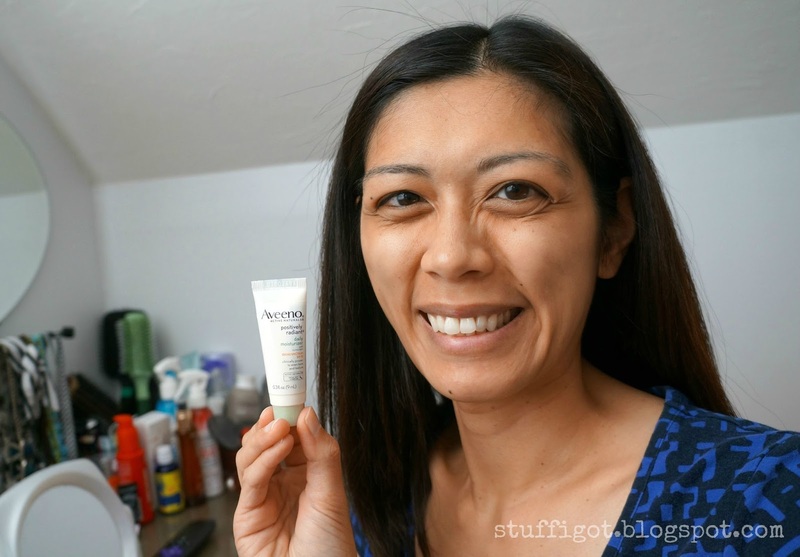 I've used Aveeno products for my body and hair, but haven't really tried any products for my face before. 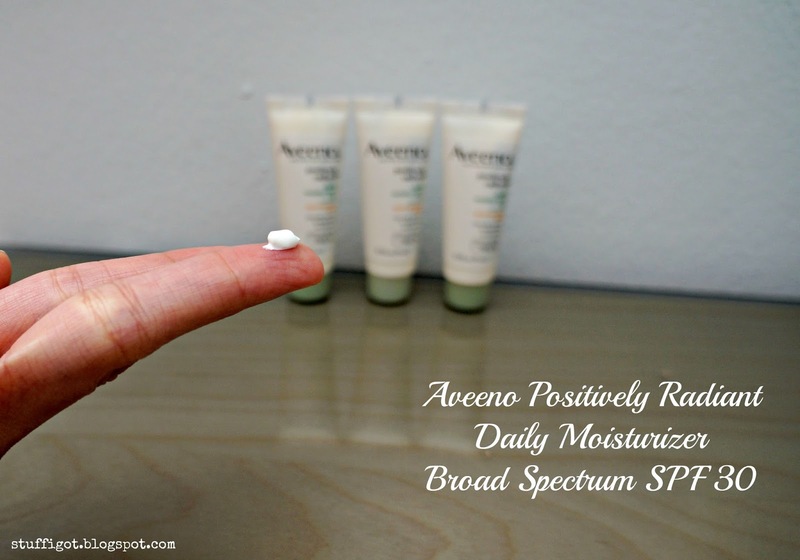 I received three small samples of the Aveeno Positively Radiant Daily Moisturizer. This moisturizer is clinically proven to even skin tone and texture in just 4 weeks. It uses ACTIVE NATURALS Total Soy Complex and natural light diffusers to help improve the look of brown spots, leaving skin looking luminous. The moisturizer was light and absorbed pretty quickly into my skin. It left my skin feeling moisturized and looking bright. But, I didn't like the scent. The moisturizer contains SPF 30 sunscreen and to me, it smells like sunscreen. 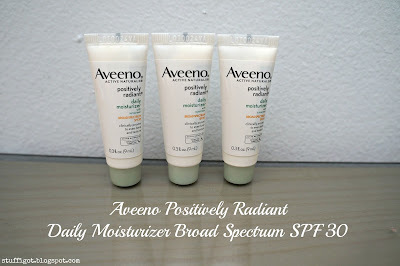 It would have been nice if it smelled more like the Aveeno Protect + Hydrate Facial Sunscreen. Other than the scent, I liked the moisturizer. It did a good job at keeping my skin hydrated and it should be good to use in the upcoming colder months, when my skin tends to be drier. I haven't really noticed any changes in my skin tone or texture, but I also haven't been using it that long. I'll update this review if I do notice any big changes in the next few weeks. 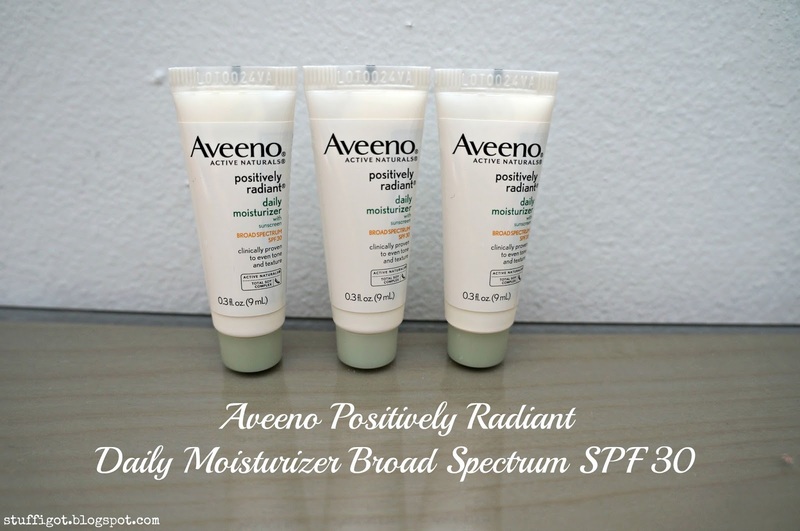 Aveeno Positively Radiant Daily Moisturizer Broad Spectrum SPF 30 retails for $14.99 for a 2.5-fl oz bottle. It can be purchased in stores and online.